Everest crystal is our most exclusive line of corporate crystal awards. We designed Everest Crystal Awards to recognize extraordinary individuals worthy of superior recognition. Each crystal award is a vision conceived by our top designers and handcrafted by skilled artisans. 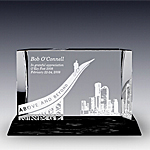 We specialize in design, production and engraving of crystal corporate recognition products and gifts. Our crystal awards and crystal trophies serve a verity of recognition functions such as motivational awards, corporate recognition awards, service awards, academic awards, sports trophies, golf trophies, and executive gifts. All of our crystal awards and trophies are grouped in the following theme collections: Everest awards, award plaques, globe awards, star awards, eagle awards, flame awards, crystal obelisks, mountain awards, sculptural awards, sports trophies, crystal paperweights, desktop gifts, crystal clocks, crystal vases and bowls. Our on-line catalog is dynamic. Our crystal designers are constantly creating new crystal awards and trophy styles as well as custom designs. Please visit us often to view our new unique design creations. All of our crystal awards can be customized and personalized with logo and text engraving. As a commitment to our customers, we offer FREE engraving on all of our crystal awards and trophies. All of our products can securely be ordered on-line. In addition, rush crystal awards are available as well as budget awards and trophies. Large Mirage Clock offers a generous engraving area and is perfect for personalization with extensive wording. When engraved, your logo and personalization text appear to float in the air creating a weightless illusion. Packaged in a satin lined deluxe presentation box this crystal award clock is an impressive executive gift. Our crystal clocks make perfect gifts for corporate recognition and service awards. Recognize commitment and dedication with our timeless and practical tokens of gratitude. We created this crystal award for those who dare to soar high to achieve the highest peaks of success and defy the gravity of obstacles. The award features a crystal mountain peak and a pewter eagle soaring high above the mountains.